Come celebrate opening day at America’s oldest, continuous open-air market!! Join us in beautiful Centre Square to kick-off the market’s 2019 regular season with the annual ribbon cutting. Opening day will begin the celebration of the market’s 267th year — selling fresh and local foods and specialty wares since 1752. 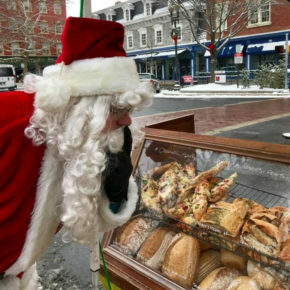 Come meet the farmers, food artisans, and specialty product makers who continue the long tradition of commerce in downtown Easton. Join us for a delicious Saturday featuring ‘everything strawberry’ – strawberry shortcake, strawberry cocktails, fresh berries at our produce vendors and lots of berry-licious vendor specials. 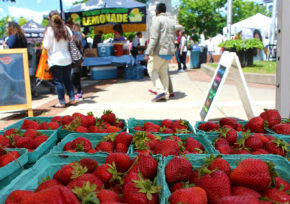 Vendors will be offering the best of local strawberries – so sweet and delicious – it’s like eating a piece of sunshine. Live music and kids crafts make this a ‘berry’ special day at EFM! The Valley’s hottest veggie race returns for its 13th year! 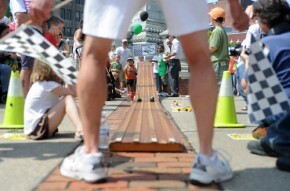 Get ready to squash the competition in this fun and zany race. Entry fee $5 – includes your choice of zucchini, wheels & axles, commemorative racing necklace, and access to carving tools and accessories with expert assistance from the Zuke 500 Pit Crew. Carving from 9 am – 10:45 am. Race begins at 11:00 am. Prizes will be awarded for the fastest car in each category: Sports Car, Mid-Size and Monster Truck. Cars may be pre-carved but wheels must be attached directly to zucchini. Chassis or platforms of any sort are strictly prohibited. Don’t forget to visit the Zucchini 500 photo station where you can snap a pic of your friends or family in a zucchini car! Savor the sweetness of summer with plump, juicy peaches. EFM’s vendors pull out all the stops to satisfy your craving for that fuzzy peach goodness. Indulge in peach cobbler, peach smoothies, peach sangria, peach pie and peaches by the bushel! It’s all peachy!! It’s tomato time! Come celebrate summer’s shining star in all its glorious forms. Taste test your way through a table of farm-fresh heirlooms, savor their subtle nuances, learn about the many varieties of tomatoes grown in the Lehigh Valley and watch the chef demo about how you can enjoy the flavors of tomatoes long after the season is over. EFM vendors will have some tomato-delish specialties along with lots of local juicy tomatoes fresh from the farm. Kids activities, live music and more! A celebration of the sunflower. EFM’s signature flower. Learn some fun facts about this historic native North American plant — what it symbolizes, how it got its name, and why sunflowers face towards the East. September brings a bounty of sunflowers to EFM, so shop the market and find different varieties grown at EFM vendor farms for you to admire and take home! It’s HOT-HOT-HOT! Peppers are in their prime in mid-September and there are an amazing number of sweet and hot varieties available from EFM vendors. Popular in Central America for thousands of years, peppers are now a favorite of many local chefs and home cooks. Just ask EFM’s produce farmers about how different varieties can add flavor and often a bit of a kick to recipes. And if you can take the heat, join other fire-eaters at EFM’s infamous “10 Deadly Peppers” Hot Pepper Eating Competition to test how hot you can go! Visit the farm-to-fest area where EFM vendors will be selling their fresh and local foods and specialty items in the 300 block of Northampton Street near the Easton Public Market on Saturday, October 5th. 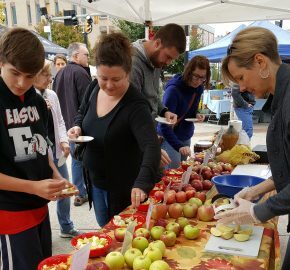 Come celebrate the fall with some old-fashioned harvest fun… live music, apple pie eating contest and apple sampling with 20 varieties of Pennsylvania and New Jersey apples! Apples abound at EFM at Apple Jam along with fresh apple cider, apple cider donuts and apple fritters. And don’t forget that one of our favorite local bands will be jammin’ in the square for your entertainment while you take a bite out of the forbidden fruit! Visit the farm-to-fest area where EFM vendors will be selling their fresh and local foods and specialty items in the 300 block of Northampton Street near the Easton Public Market on Saturday, November 2nd. 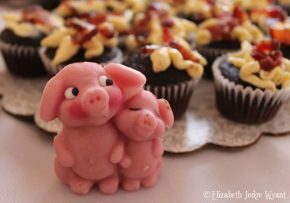 ‘Tis the season to support your local farmers, bakers and makers! It might be chilly, but it’s sure to get you in the holiday spirit! And we have plenty of ways to warm your heart. Grab a hot cup of coffee or mulled cider and shop the market for some fresh and local gifts while enjoying holiday music.